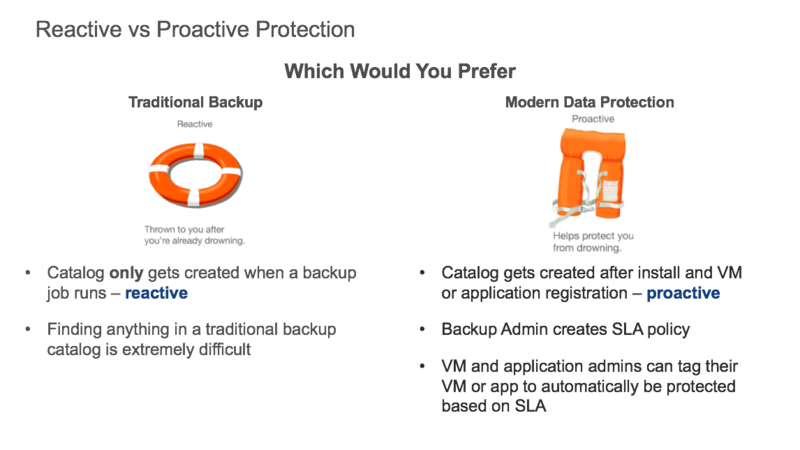 Let’s take a look at one example of how traditional backup is morphing to become more modern. With new technologies such as IBM’s Spectrum Protect Plus – once installed the applications or VMs are registered with the data protection application. Once this is done, Spectrum Protect Plus knows about all the data in the environment and shows what is and isn’t protected. The backup admin can the ask the question “does that system needs to be protected or not.” Sometimes new systems, VMs or applications don’t need a specific backup. Spectrum Protect Plus shows administrators, each time they log into the application, what VMs or applications are being protected and which aren’t and allow them to diagnose if they need to be, fix a problem or move on. Backup administrators then create backup SLAs that can be assigned to the different virtual centers, individual VMs or applications. The interesting thing about this is that the backup admin can ask the vm admin which policy do they want to assign to their virtual center. All VMs in that virtual center will take on the profile of that SLA. If they need to have a different policy for a different VM that may need a different SLA, they can assign that as well. What is more interesting is that as new systems or applications are added to the environment, they take on the SLA as the overall virtual environment or application. There is no need to specifically go in and set it up or tell someone that a new system or application has been create and needs to be backed up. Now they may need to be changed but you will never be in a position where your data isn’t protection. To continue this notion of proactive data protection, when a vm admin or dba adds a system to their environment – Because Spectrum Protect Plus supports “tagging” the admins can tag their systems such that they just automatically fall into the SLA policy they need. So, the data protection admins can take themselves out of the whole process. They can create SLAs and let the admins know that as they create systems, they just tag them such that they fall into the SLA they need without having to get involved. Check out this video to see how simple and easy it is to set up SLA polices and how easy it is to configure your environment. This is what we call setting up a programmatic infrastructure. It is providing self-service to the teams of people that need to be accountable for their environments and allowing IT to be freed up to work on more strategic initiatives. We talk about the rise of the “Infrastructure Developer”. This is the direction companies want to go these days. The setting up of the infrastructure such that it is consumable by the people that need to use it and rely on it and taking a lot of the problematic and error prone communication out of the picture.